This recipe came to me from a Wazwaan Ghulam Mohammed. Wazwaan is a traditional Kashmiri cook who specialises in large banquets. 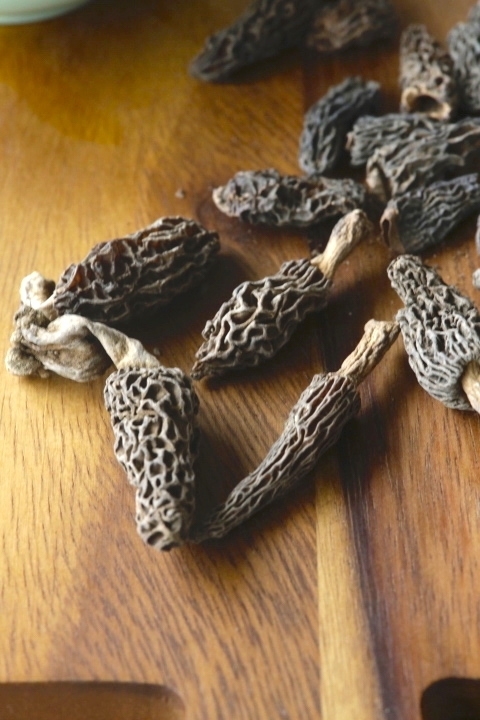 He lamented that very few people made this dish anymore because Morels are very expensive and being exported all over the world making them even more inaccessible in the valley. 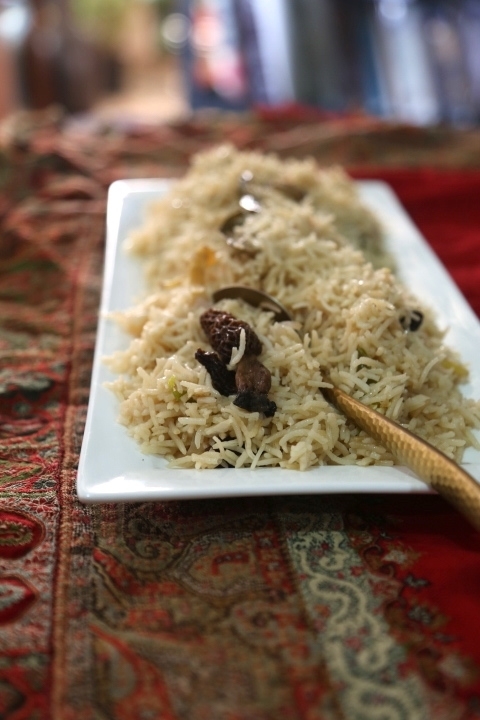 Gucchi pulao is reserved for special occasions such as weddings and births. 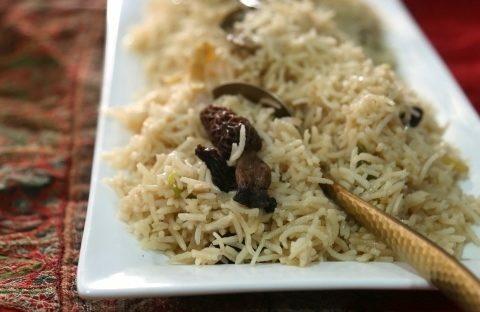 The pulao is subtly flavoured so as not to interfere with the delicate yet distinct aromas and taste of Gucchi. 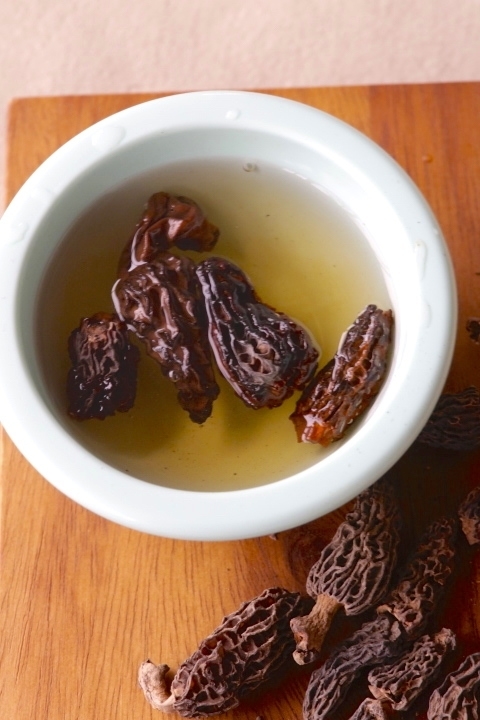 Soak the morels in a cup of warm stock of your choice and reserve.Drain and squeeze dry. The slice in half. Add the leftover liquid to the stock you will use for the rice and reserve the sliced morels. Heat the stock with 4 cups of water and 1 teaspoon salt. Add the cloves, cardamom, cinnamon stick, aniseed, bay leaf and garlic to the stock and cook on high heat until reduced to 4 cups of liquid. While the stock is cooking fry your onions in hot oil until crispy. Drain and reserve. When the stock has reduced drain out all the spices and garlic with a slotted spoon and discard. Keep the stock on a low simmer. Heat the ghee with 1 tablespoon of oil from the oil you used to fry the onions in a skillet and when warm saute the halved morels on medium heat for about 30 seconds. Add the drained rice and saute again for a minute on a medium flame until all the rice is coated in ghee and oil. Add the rice and morels to the hot stock. Add half the fried onions. Cover and cook until rice is fluffy. Fluff the rice with a fork, season with more salt if required and garnish with remaining onions.